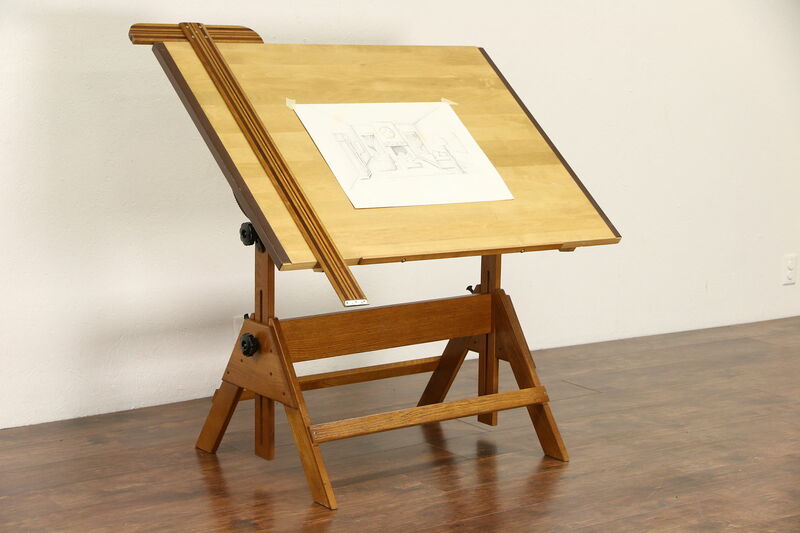 A drafting desk or artist's drawing table adjusts in every direction, and even makes a nice wine and cheese table as well. Dated 1992, the base is solid oak with cast iron mounts, the top is fine grained maple, better for drawing. There is an excellent restored finish which preserves a few mars and scratches for a little antique character on this American made vintage commercial or industrial grade furniture. The top is 42" x 31," if adjusted flat, height adjusts from about 31" to 41" tall, and the angle is also securely adjustable.